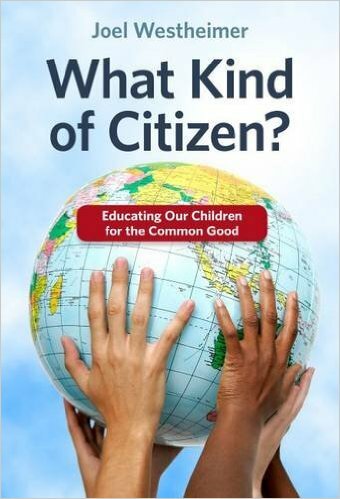 Joel Westheimer is the author of the book What Kind of Citizen: Educating Our Children for the Common Good and is speaking in Red Deer this Thursday, November 5, 2015. Joel's book asks us to imagine the kind of society we would like to live in and shows how schools might best be used to make that vision a reality. What does an ideal school look like in your mind? What lessons are being conveyed? How are children and teachers interacting? What kinds of responsibilities are students being asked to take on? What vision of the 'good' society is this school asking students to imagine? Are they learning the skills and habits they would need to help bring that society into being? Are they learning to recognize injustice and work with others in their communities to diminish it? I prefer to think about schools, not as vehicles of transmission of knowledge (though they are that too), but as places where children learn about the society in which they are growing up, how they might engage in productive ways, and how they fight for change when change is warranted. Schools have always taught lessons in citizenship, moral values, good behaviour and 'character'. Even before there was formal schooling, informal education was replete with these kinds of goals. Contemporary schools inevitably teach these lessons as well. For example, schools teach children to follow rules, and to be sure, sometimes following the rules is necessary. But does being a 'good' citizen ever require questioning those rules? What is the proper balance between rule following and thinking about the origins and purpose of those rules? We can imagine classrooms that aspire to that balance. Teaching children content like reading, writing and arithmetic in isolation of morals is developmentally inappropriate. I did not become a teacher so that I could merely prepare children to live in a cruel and unjust world. I became a teacher so that I could help children grow up and make the world a better place. The real world is not a fixed and known place -- the real world can be made and unmade by the people who live there. I want to teach my students to be prepared to live in the real world while inspiring them to make it better. I'm reading Joel Westheimer's book What Kind of Citizen? and looking forward to hear him speak this Thursday, November 5, 2015 in Red Deer.